Trying to balance an online presence while being a father and a friend isn’t always easy. Finding a balance between being a good husband, father, friend, and blogger is a difficult balance to maintain. Most of the time my online identity is what falls behind but that is ok, because that is the priority I have set in life. My family comes first and with my newborn baby girl, I have not been able to do much lately, and my friends come second but I am sure they feel that is a distant second. I try to do as much as I can with my Nerd Management brothers but alas I fall behind. Luckily they understand as well. The good thing about an online blog is that it will always be there no matter how many times you quit and then go back. It always waits for you just sitting there waiting for you to tell it what you want to say. Some people have a lot to say and some people have a little. Some people have followers that care and some people just put words into the vastness of space. Either way, its there waiting for you. A lot has happened since the last time I blogged and we will see what I have to say and how much I will be able to say it in the coming time. 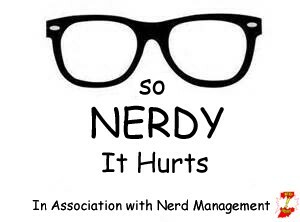 Just a reminder for those who remember, http://www.nerdmgmt.com is no longer around but we can be found on soundcloud with season 7 coming up and on facebook as Nerd Management.